Partly cloudy. Low 42F. Winds WSW at 5 to 10 mph..
Wind turbines are shown July 2, 2012 in Shirley Basin near Medicine Bow. 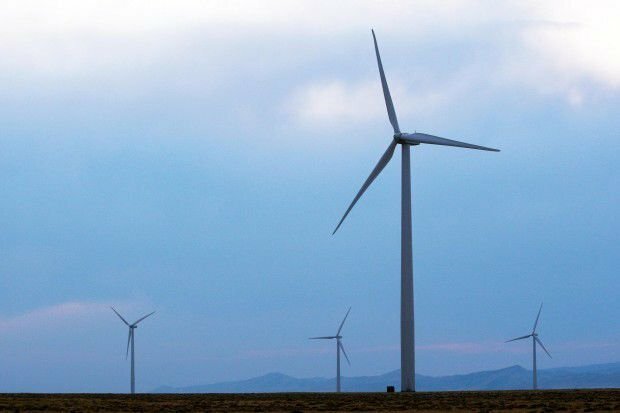 A preliminary report by the National Renewable Energy Laboratory suggests Wyoming wind power could potentially save California ratepayers $750 million annually if transmission lines existed. Wind turbines are shown in July 2012 in Shirley Basin near Medicine Bow. A legislative committee recently halted a bill that would have hiked the wind energy generation tax to $3 per megawatt hour. CHEYENNE -- A preliminary report suggests Wyoming wind power could save California ratepayers $750 million annually. Those findings, announced by the National Renewable Energy Laboratory at a meeting of the Wyoming Infrastructure Authority here on Friday, was the latest in a series of reports backed by Cowboy State policymakers aimed at promoting the state’s wind industry. California law requires that 33 percent of all Golden State electricity generation come from renewable sources by 2020. The renewable portfolio standard, as the law is known, represents a potential boon to Wyoming wind developers who can capture the state’s strong, consistent winds. Two large-scale wind projects proposed for the state would sell power directly to customers in southern California. The Infrastructure Authority embarked on a campaign to sell that wind to California in 2012. On Friday, they said the latest study would bolster their case. “As soon as the study has been published in a couple weeks, we’ll be on the road,” Loyd Drain, executive director of the Infrastructure Authority, told a crowd of state officials, industry representatives and others at the Little America Hotel. The would-be wind companies face two hurdles in sending their electricity to California and its 38 million people. The first challenge is one of transmitting the electricity. Currently, no transmission lines exist between Wyoming and California. The second is convincing California policymakers to choose Wyoming renewables over similar projects in the Golden State. TransWest Express, a proposed $3 billion transmission line running from near Rawlins to south of Las Vegas, aims to fix the first problem by connecting the 3,000-megawatt Chokecherry-Sierra Madre Wind Project in Wyoming to customers in southern California. Denver-based Anschutz Corp. is spearheading both developments through two subsidiaries, The Power Company of Wyoming and TransWest. David Smith, TransWest director of engineering, said the federal Bureau of Land Management is expected to issue a permit for the transmission line this year. Construction is projected to begin in 2015, and operations are expected to start in 2017. The project was first proposed in 2005 and bought by Anschutz in 2008. TransWest is not alone. The Pathfinder Zephyr Wind project would produce between 2,000 and 3,000 megawatts of power at a wind farm near Chugwater. The power would be transmitted to customers in southern California via the Zephyr Power Line. Andy Cotter, Zephyr assistant project director, said the company is waiting for the wind farm to be permitted before applying for permits on the transmission line. The study by the National Renewable Energy Laboratory, based in Golden, Colo., was commissioned by the Infrastructure Authority to bolster the Cowboy State’s case with Californian authorities. The preliminary conclusions of the report, which will be finalized and officially published in February, are in line with previous studies finding that Wyoming wind is a cost-effective means of providing renewable energy, said Greg Brinkman, an energy analysis engineer at the laboratory. A University of Wyoming study found wind projects in the state would save Golden State ratepayers $100 million annually. A 2011 Western Electricity Coordinating Council found such projects would save California customers $600 million annually. Wyoming’s high wind capacity and low capital costs make wind development an attractive alternative relative to California solar, wind and geothermal, Brinkman said. The study found the Wyoming wind projects have a cost benefit ratio of 2.8 to 1. Even in the worst-case scenario considered by planners, where the wind production tax credit is repealed, the ratio is 1.5 to 1, he said. “When utilities planners see numbers of two or higher, this is relatively unusual, and indicates very positive economics, very positive incentives to make this investment,” he said.